I registered for the Chicago Marathon lottery this week. I’ve had this race on the radar for a while but of course decided to wait until they made it a lottery registration system before deciding to pull the trigger. 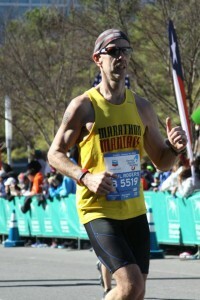 I am usually not a “big marathon” kind of guy, and usually prefer races that are around or under the 10,000 runner mark. But for a big race Chicago has a reputation for being logistically easy and a fast course so I am putting my big-race bias aside and will see if I can get in. 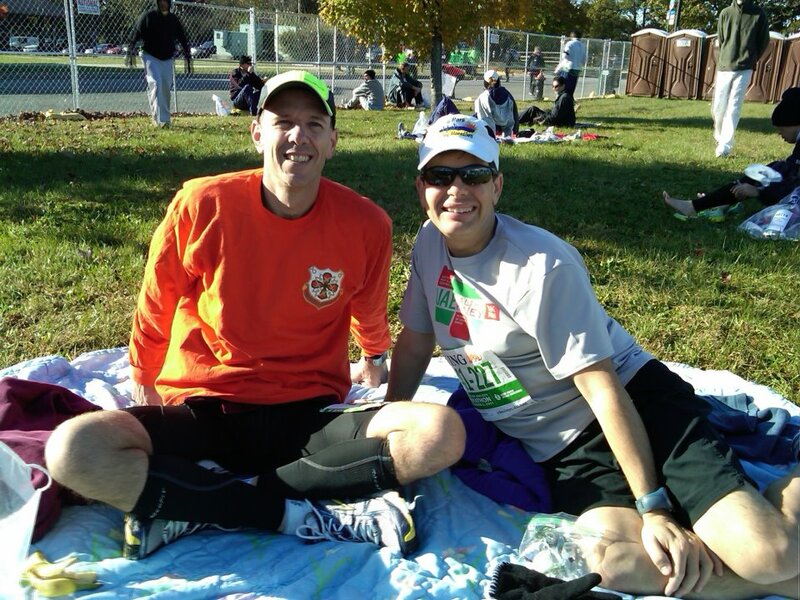 I love Fall marathons and usually try and run 2 or 3 in the Fall. 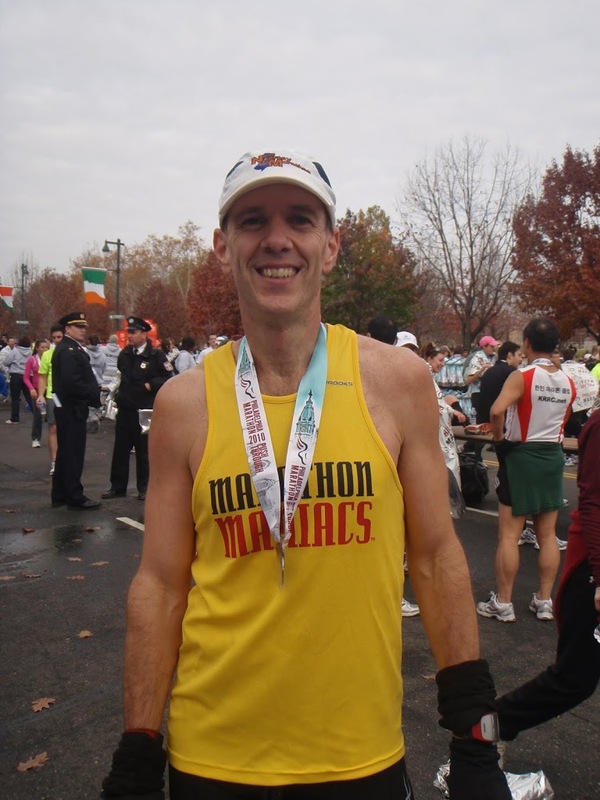 Because Chicago is kind of notorious for having weird weather it is an especially prudent move to have a back up race, so I am considering signing up for the Indianapolis Monumental Marathon as well, since that is supposed to be a great race as well and hits my sweet spot for marathon size. That way I can knock of IL and IN from the 50 state map. 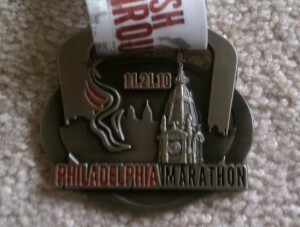 And I may still throw the Philadelphia Marathon in there, just because it’s a bad idea. The first thing on the list I hold in a different league than the next two. It is the most fundamental part of the whole running thing for me and is really more of a lifestyle paradigm than a goal achievement. By attaining a high level of fitness through distance running the rest of the things in my life become easier. Plus I will hopefully live a longer and more fruitful life, enabling me to annoy the people I love much longer than if I was sedentary. 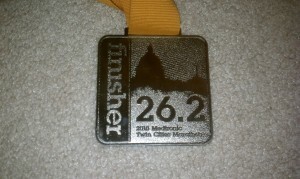 This is one of those stupid yet kind of cool things that serial marathoners do. Putting this on the list at least ensures that I have a long term outlook, since my time and monetary resources don’t lend themselves to me banging out all 50 states in a year. It also happens to be a very cool way to see other locations and sample some of the races that runners across the country brag about. 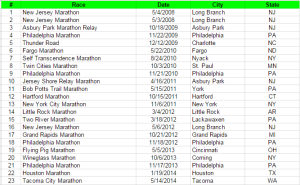 So far I am up to 23 marathons in 12 states so I still have a long way to go. This is the loftiest goal by far. 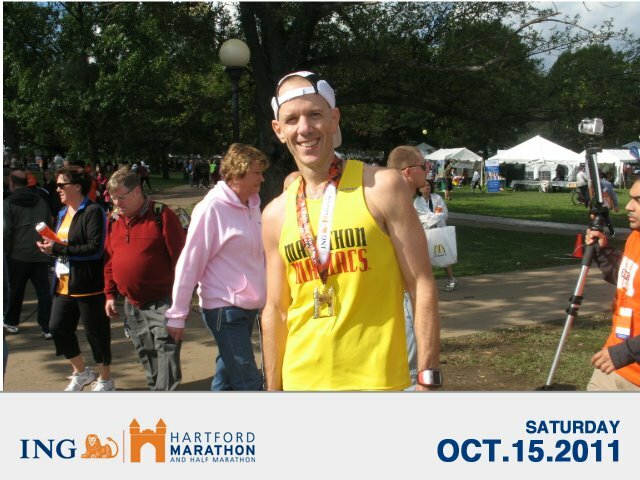 I am not gifted with natural born speed, and my fastest marathon to date still leaves me about 20 minutes from my Boston qualifying time. However, with some training tweaks and nutritional changes I don’t think it’s completely off the table for me either. The historical significance this race holds coupled with the national sentiment of recent events makes it worthy of a stretch goal. I had all but let this thing wither and die on the vine. Alas, social media killed the once thriving world of blogging. Well, most of it anyway. When I went to revive this thing and looked at the blog roll I used to keep, most of those bloggers have been dormant since 2010, and I’m sure they are not coming back. But I had already purchased my domain years ago, and had a fair amount of stuff (albeit old) on the old blogpost site. So I’m moving it over to WordPress and reviving it, if only to be accountable to myself. 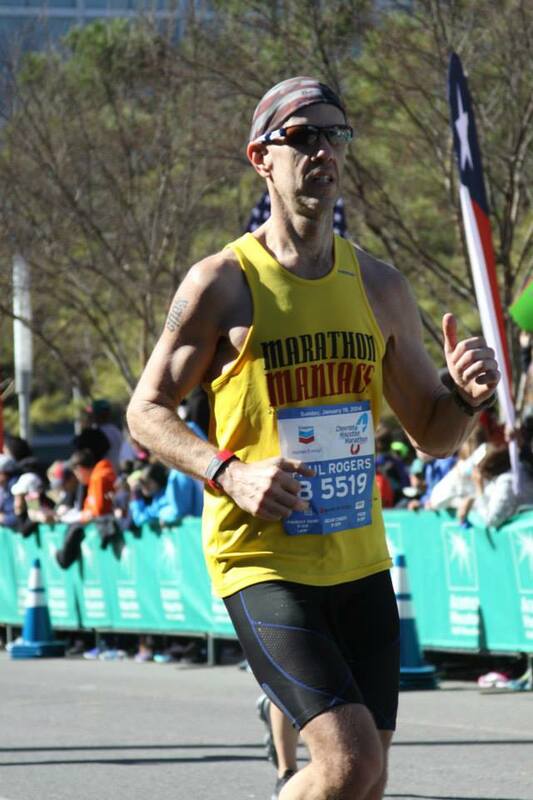 It is still focused on my main passion of marathoning, with a small dose of nutrition thrown in, since I think that is what is going to have me reaching my future running goals. Of those 4 races, I think Grand Rapids will be the heavy handed favorite for a PR shot this year. It’s a really flat and fast course and I love preparing for an October marathon. Although I might have a shot at doing something decent at NJ, we’ll see! I ran the Philadelphia Marathon last Sunday. This is my second Philly Marathon and my third time participating in the race, since I ran the half marathon in 2008 (my current PR, I definitely need to race another half marathon). 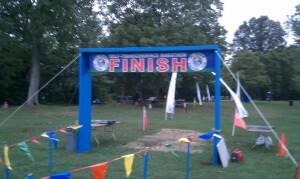 I love this race – I grew up a stone’s throw from Philly (on the New Jersey side) so I feel a kinship for this course. Plus, since it’s a local race, I know a lot of the local marathoners who run it. I drove down to the expo on Friday with Flyers26 and ended up meeting up with him the morning of the race. Neither one of us were publicly committed to a time goal. He lined up closer to the 3:50 pacer and I backed off a bit not wanting to go out at his pace. I was, however, hoping to save up enough steam to catch up with him on the second half of the course. The weather for this race was great. 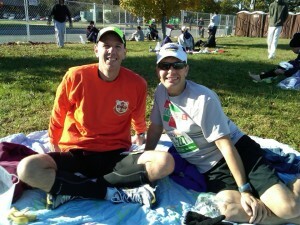 It was somewhere around mid to high 30’s for the start and probably around 10-15 degrees warmer at the finish. The crowds in center city and Manayunk came out in full force, much more so than I remember in the past. A lot of people complain about the 2nd half of this course, since it is a quiet jaunt up Kelly Drive to Manayunk and back. I love this stretch – you get to see the leaders coming in going up Kelly Drive and then you get to settle in to your “zone” on the way back. I saw Flyers26 in Manayunk and shouted out to him to “watch behind him”. I think at that point he was probably about a mile ahead of me so I spent the last 6 miles trying to catch up to him. 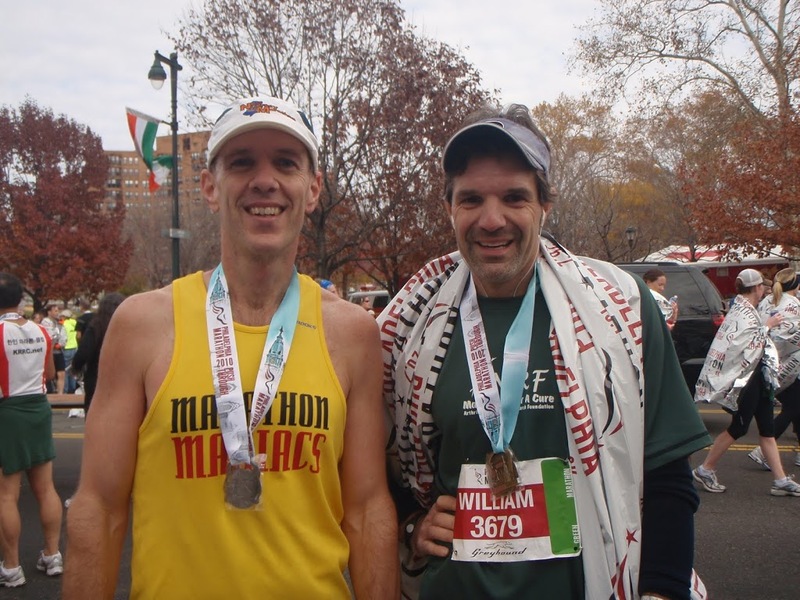 I came pretty damn close too, we met at the finish line and our chip times ended up being withing 2 seconds of each other – pretty crazy after running for 26 miles. 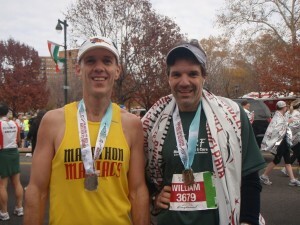 Congratulations to Flyers for scoring Marathon Maniac status with two marathons in two weeks (NYC and Philly). I ran the Family Services 5k in Lumberton, NJ this past Saturday. This is the first 5k I’ve run since the Eastampton 5k, nearly 2 1/2 years ago. I knew I should have a solid 5k PR lurking in me since I am smack in the middle of a couple of marathon cycles. I typically hate the intense pain infusion of a 5k race but figured it would be good training stimulus for the upcoming Philadelphia Marathon. 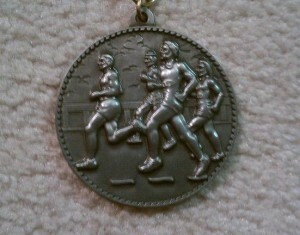 Good enough for 2nd place in the Males 40-44 division. The guy who came in first in the M40-44 ran a 18:11, so I was a long way behind him. Oh well, a nice PR and hopefully a good sign for the Philly Marathon. 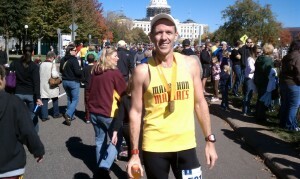 I ran the Twin Cities Marathon this past weekend. I originally signed up for this race back in January. At that time a lot of people I know were signing up to run the Chicago Marathon, which is next weekend. I almost pulled the trigger on Chicago, but didn’t really want to deal with the logistics of being out there with 45,000 other people. 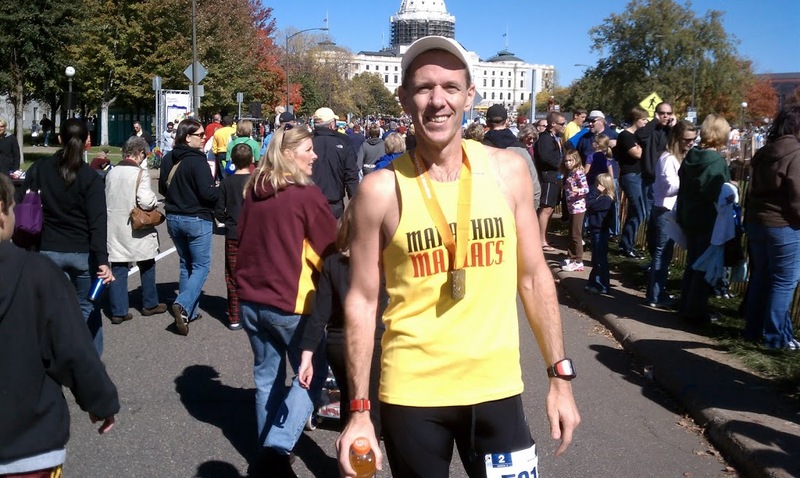 I still kind of like the smaller marathons (if Twin Cities counts as smaller, with 8200+ finishers), and am SO glad I chose this race.I flew in on Saturday and stayed at a hotel that was a couple of hundred yards from the finish line in St. Paul. The course is a point to point which starts at the Metrodome in Minneapolis. The buses to the start line conveniently left from my hotel in the morning, so this race could not have been any easier to run. I stayed in the Metrodome (home of the Vikings) until about 10 minutes before the start, which was both a blessing and a curse. Blessing, since the near perfect temperature of 38 degrees made it a little cool to be hanging outside in a singlet and shorts. Curse, since by the time I got outside, it was very hard to get very far in the starting corrals.I lined up somewhere behind the 5 hour pace groups and couldn’t get any further. Since my goal was to come in under 4 hours, this was kind of a drag but I figured I would make it up pretty easily in the first couple of miles. 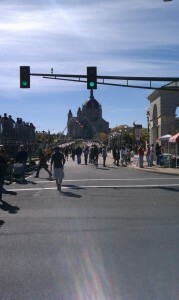 The race was a lot more crowded than I thought it would be however. It was pretty congested for the first several miles, and it wasn’t until around mile 8 that I was able to get past the 4:15 pace group and get into a more aggressive 4hr pace. I can’t say enough good things about this race. 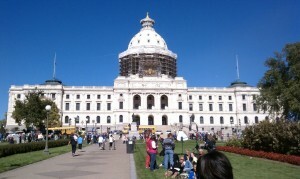 The weather was perfect for running – stayed around the 40’s and not a cloud in the sky. There were people lining the entire course and they were loud and enthusiastic. Alan Page stands atop mile 3 playing his tuba. Somewhere around mile 24 I saw Senator and SNL alum Al Franken on the sidelines cheering people. The course passes many of the MN lakes and provides beautiful scenery, but in honesty I was so dead set on hitting my goal I know I didn’t take advantage of the landscape enough. 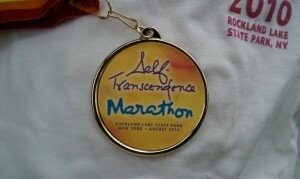 I ran the Self Transcendence Marathon yesterday. 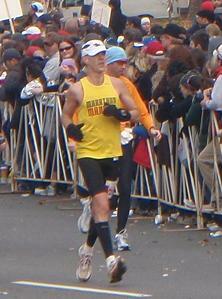 This is a small marathon usually held during the week in Nyack, NY. There is not a lot of info on the web about it so I figured I should do a blog posting. Hopefully anyone considering this race in the future will stumble across this race report – it is a cool, offbeat race which is worth running if you within easy striking distance. 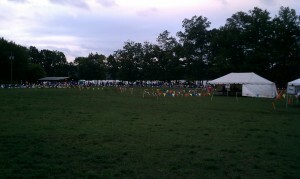 The race is organized by the followers of Sri Chinmoy. The best way to describe the group is that they adopt the philosophies of Sri Chinmoy to unlock spiritual awareness that allows you to achieve tremendous physical accomplishments (hope that does them justice). The bulk of the runners were Europeans as I think that is where Sri Chinmoy hails from, so there was a very eclectic mix of languages on the course. They also turn out in full support, playing music and reading poetry on the course to inspire runners. A little different than any other race I’ve run before. 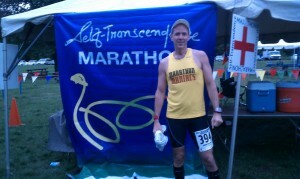 In addition to Sri Chinmoy followers there was a nice contingent of Marathon Maniacs, which is always cool. 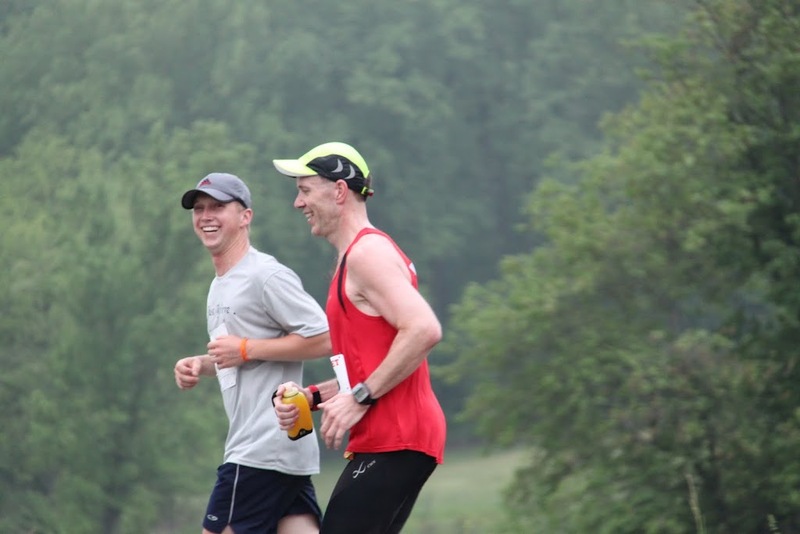 The course is a 2.96 mile loop around Rockland lake in NY, so it is a scenic ride. I did this as a training run for my Fall schedule so I was able to take it easy and take in the scenery (and poetry). Since it’s a loop course and they had 3 aid stations out, you had constant access to food/water-sports drink. They do a great job supporting the runners. The entry fee is low, the cotton shirt is nice and the medal is unremarkable. Overall a thumbs up from me – I will probably put it on the calendar for next year as it is within semi reasonable driving distance the morning of the race! 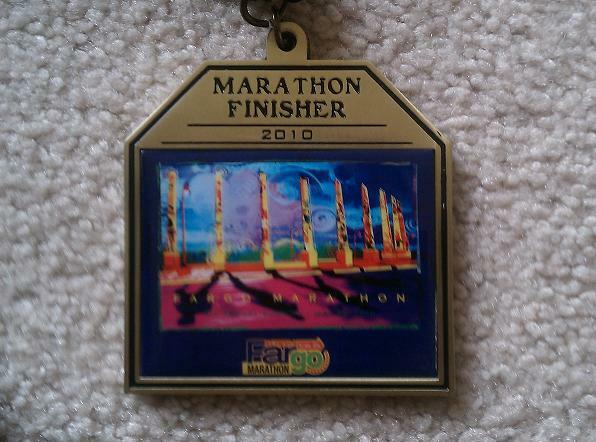 I ran the Fargo Marathon 2 weeks ago. I signed up for this race in the beginning of March, hoping to parlay any fitness I had left from my Fall marathons from last year. 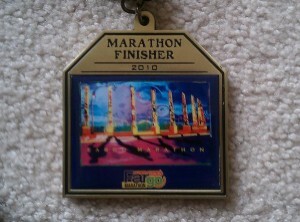 I ended up running a 4:18, which I was a little disappointed with, considering I was hoping to come in closer to 4:00. I think the condensed training cycle left me inadequately prepared. Traveling to North Dakota the day before didn’t help me either – two planes, one of which was a missed connection, sucked a little life out of me. Lesson learned: next time plan a day of travel for each plane involved in getting to the destination. Fargo was a nice race – the entire city gets behind this race. It starts and finishes at the Fargodome, which is a nice touch and provided nice cover, considering it was pouring rain at the start. I didn’t realize until midway through the race that part of the course runs through Minnesota, which was cool and a nice prelude to the Twin Cities Marathon in October. I ended up sharing the last few miles with Janet (pictured below) who had previously run Grandma’s Marathon in Duluth, Mn. 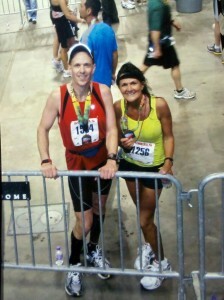 Thanks to Janet’s husband for my only race photo. 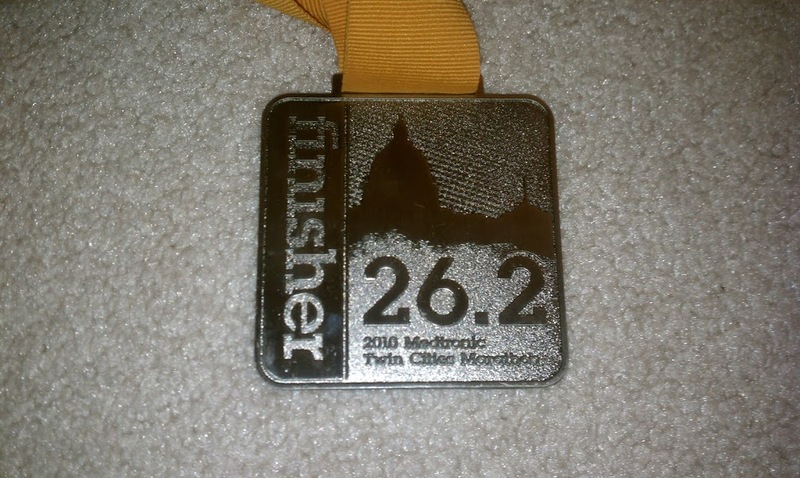 So I have 16 weeks until the Twin Cities Marathon on Oct. 2nd. 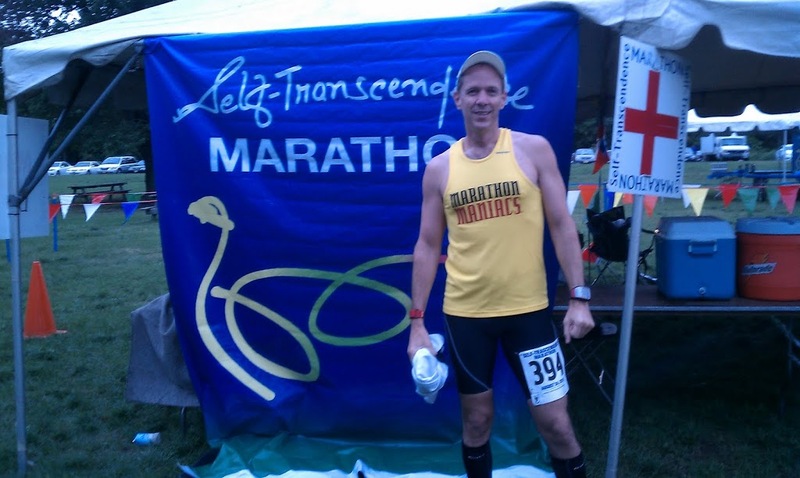 I will likely treat Twin Cities as a training run for the Philadelphia Marathon in November but am still a little on the fence. The only thing I know for sure is I am anxious to run a ton of miles over the summer and to dedicate the bulk of it to training by heart rate. 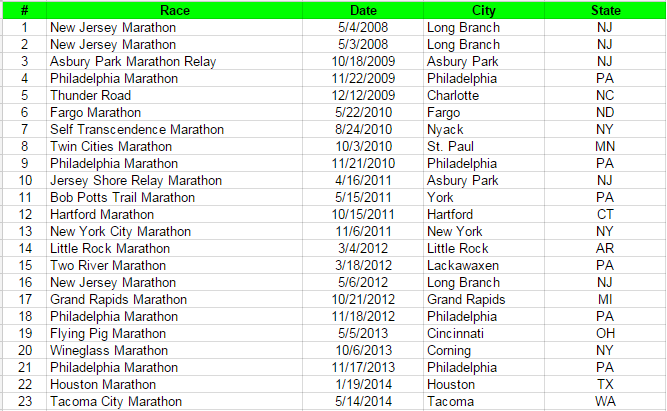 Other than that, I am just looking forward to running a bunch of races in the Fall. 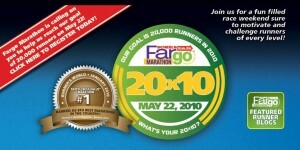 I signed up this week to run the Fargo Marathon on May 22nd. I have wanted to do this race for a while for some reason. Runner’s World recently ranked it in it’s reader’s top 10 favorite marathons, so that helped sway my decision a little. 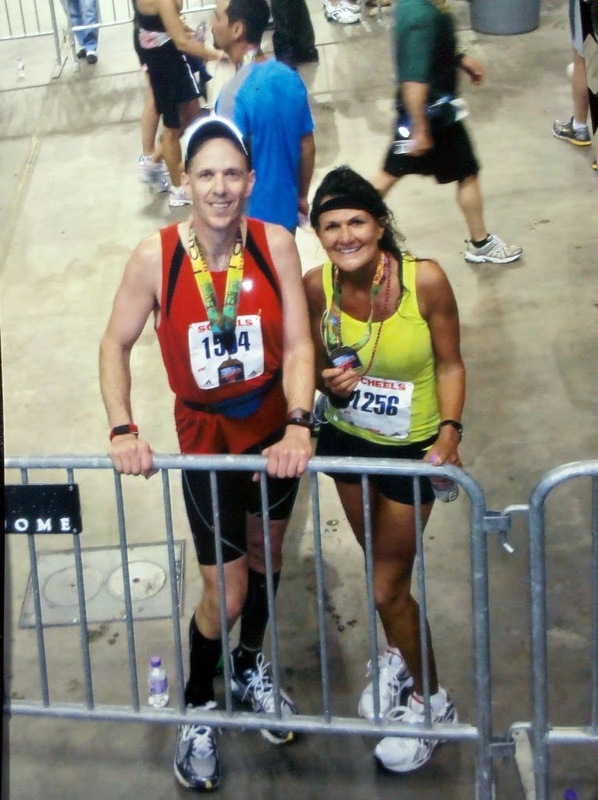 I was originally thinking about running a marathon in March, April & May – I scrapped that idea in favor of putting forth a good training effort and trying to run a decent race in Fargo. I think this training cycle will be my first foray into a Pfitzinger training plan. I have been wanting to follow a Pfitzinger plan for a while but have always opted for the “easier to follow” nature of a Higdon styled plan. By the time I signed up for Fargo, I had a solid base of 40-50 mpw weeks, so I jumped into the 10th week of his 12/55 plan. If things go well in this training cycle I will probably pick one of his 18 week plans for the Twin Cities Marathon in October.